Getting sick means it’s time to take a moment, sit back, and reflect. Have I been taking on too much? Do I need to talk about something to release some emotion that is pent up? How do I feel? Illness can start as something simple, or take you by storm. Whatever the cause, having something on hand to provide relief makes life livable. Instead of reaching for Ibuprofen, Nyquil, Claritin, or Pepto-Bismol, here are some tips on a greener, holistic approach to remedying headaches, stomachaches, colds, coughs, and allergies to name only a few. These symptoms are merely the body telling us something is wrong. A quick fix may help momentarily but these are signs that there are deeper issues that should be addressed. Prevention is key—especially now, when simply going out in public can be a health hazard. So beware and take care with these simple alternative choices to conventional medicines. Cough Syrup is filled with chemicals, colors and sweeteners. A cough means there is excess phlegm in the system. Instead of suppressing it, soothe and release with osha, a strong-tasting deep-rooted herb that will cut through the thickest mucous. Mullein, fennel and marshmallow root can be added. Th ere are plenty of combination cough syrups in health food stores mixed with the original soother, honey, to help get through the night. 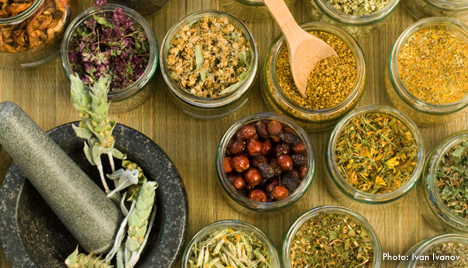 Get used to the unique and strong tasting herbs and elixirs. Pungency means strong medicine. Mix it with ginger tea, a dash of fresh lemon and cayenne, and brave it with a minced clove of garlic. Cut dairy and flour products of all kinds from your diet for a few days, load up with lightly steamed vegetables, soft cooked grains, miso or chicken/beef broths with chunks of vegetables simmered in it: add garlic, ginger, and a bit of wakame—nurture the gut and relax the lungs. Aspirin, a chemical that blocks the message of pain coming into our sensory channels, creates too many depletions and risks. This distraction is possibly the most detrimental situation that goes on within our being. Cowboys used to stick a branch of white willow bark, the “original” aspirin, in the strap of their hats. It’s available alone or often in a combination with feverfew and vitamin C or magnesium. You may have to take it every 15 minutes until some relief is felt. In conjunction with this, try and find out the cause of the symptoms: a phone call from your ex; a moment of grief or frustration the day before that left you tongue-tied? Our emotions are often the root of our discomfort. Or maybe it was just too much beer and chips yesterday. And so a day or two of steamed vegetables, soups and fruit is in order to help bring on some alkalinity. Other anti-inflammatories to help relieve pain include: ginger, curcurmin (comes from turmeric) and skullcap or combinations such as Zyfl amend by New Chapter, which combines these herbal pioneers into tablets that can deliver the necessary relief. Allergy medication is perhaps the biggest mask of all. Allergies are signs the body is screaming that it is overloaded. Too many toxins are in circulation and the slightest pollen, wind, dust, dander or what have you will set the slew of scratchy, watery eyes, runny nose, aches, pains and sheer misery. Before the season hits, usually right after winter, clean your blood. Reduce dairy and fl our products, up the vegetables especially leafy greens, both cooked and raw. Drink plenty of water and nettle tea or tincture. Ginger, garlic, burdock root, shiitake mushroom, parsley, and radish, especially daikon, all help cleanse. These foods help cut through old and new fats and proteins which are largely the cause of toxic build-up. And then, homeopathic Sabadil by Boiron, Allergy by BHI/Heel, or any combination from any of the others, see which one will take the edge off. Homeopathy works by exposing the body to the actual allergen, making it recognize it, and the body magically develops its own antigens to ward the invader off , building immunity. Even straight-up homeopathic Juniper is available in many health food stores. Digestive enzymes can be useful taken on an empty stomach too. They eat up undigested food in the blood helping to clean it up. Antacids are simple remedies to relieve acid indigestion, heartburn, gas and bloating. Unfortunately taking them too often hides underlying conditions of gastrointestinal distress, even ulcers or appendicitis, so watch what and how you eat. Too much spice, meat, sweets, dairy, salt, fried, and processed food will lead to degeneration of many organs and systems within. These foods are highly concentrated and acid-producing. Balance with an overabundance of fresh and cooked vegetables, fruits, whole grains, beans, seeds and sea vegetables. • Cut one umeboshi plum (found in the Oriental section of most health food stores) into small pieces, and place with its pit in a small saucepan. • Cover with 3?4 cup water. • Add 1 teaspoon kuzu (much like arrowroot starch, but has healing qualities, also found in the oriental section) and dissolve with fingers. • Bring to a boil while stirring often. • Meanwhile, finely grate 1-3 teaspoons ginger and 1 green scallion and place in a mug. • When the hot mixture becomes clear and slightly thickened, pour it into mug and sip. Other herbs such as licorice, soothe the gut, even in the form of chewables called DGL. Michaels Naturopathic company makes a natural chewable comparable to Tums. Sipping licorice tea is helpful, even the candy by Panda’s, with no sugar, has been known to help. And consider digestive enzymes before or with meals to help with heavy, dense and oily/fatty foods, or take them on an empty stomach to deal with undigested food still left in the blood. Pain/Arthritis are inflammatory conditions easily ignited by stress, and again, consuming too many spicy fried foods, nightshades (tomatoes, peppers, eggplant, chard, cooked spinach, tobacco), soda, sweets, meat, and dairy. Excess acid settles in the joints eating away at the fluids, tissue and bone. There are many supplements to help from boswelia to MSM to glucosamine sulfate, shark cartilage, collagen, and a plethora of herbs easy to confuse anyone. And they all work more or less, usually over a long period of time. Try taking some kind of herb/supplement and radically change your diet. Cleanse, fast, alkalize and see how you feel. You might be amazed. For starters, stop the tomatoes, peppers, potatoes, and tropical fruits including oranges and grapefruits. Include in all meals throughout the week ginger and turmeric, cabbage, daikon, broccoli and cauliflower. Eat greens till you love them, the bitters are the best. Slow down and chew well. Whole grains are relaxing, providing a sweetness if chewed well—50 to100 times a bite—and essential sugars needed for cell growth and rejuvenation. Eat brown rice, millet, quinoa, and hull-less barley. Upset Stomach/Stomach Bug…there is nothing like a day of losing everything from both ends to rejuvenate our pledge to health again. Broth never tasted so good, simplicity was never so welcome. When something can be kept down, take colloidal silver, 10 ppm is strong enough, 2-3 times/day. And, when food can be taken, eat grapefruit seed extract. There is nothing like food-grade diatomaceous earth, which breaks down and moves out all forms of worms, parasites, bugs, even heavy metals and other toxins from environmental pollutants we inevitably breathe in. Taken with distilled water on an empty stomach daily, it keeps our system clean and provides silica, a necessary nutrient grossly lacking in our diet. Charcoal tablets help with diarrhea by moving toxins out. And lastly, make yourself some broth. Its mineral content from vegetables aids the body in complete recovery. In a pot filled with water add all large diced vegetables: carrot, celery, onion, red potato, a few garlic cloves, a piece of minced ginger and a handful of parsley. Simmer 35-45 minutes. These conditions we deal with on a daily basis may have roots in our genes, but it doesn’t excuse laziness with our eating and lifestyle habits. We can reverse any disease with the right attitude, diet, and support. Minor symptoms such as those listed above are not to be taken lightly if they are experienced more than once a week. So learn the true value of natural and home remedies, and bring the green inside. Editor’s Note: This information does not in any way replace a physician’s advice, and is provided for educational purposes only. Mention of specific products does not constitute an endorsement by Living Green Online Magazine. Roanne Lewis, whole food chef and nutritional counselor, co-authored The Taos Whole Food Cookbook and has taught whole food cooking classes throughout the United States and Canada. She lives in Taos, New Mexico with her husband, raising her son, writing and singing. For consultations and classes, at www.wholefoodscook.com. You can reach her at roanne@wholefoodscook.com. Berberine the Next Magic Bullet?